Crossing the nerve-racking Carrick-a-Rede Rope Bridge is a feat for the sure-footed—the narrow 66-foot-long (20-meter) swinging span is suspended high above the choppy Atlantic waters, connecting the Northern Irish mainland to Carrick-a-Rede Island. Originally built more than 300 years ago by salmon fishermen—and since rebuilt with sturdier materials—the National Trust-managed footbridge is now traversed by wobbly-kneed travelers who want to soak up the rugged coastal scenery. Many visitors come to the bridge on guided tours from Dublin and Belfast. Because of the bridge’s proximity to Giant’s Causeway, a UNESCO World Heritage Site just a 20-minute drive away, full-day tours often combine the two attractions, as well as other prominent Northern Ireland sights, such as Game of Thrones filming locations and the state-of-the-art Titanic Belfast, set on the site of the former Harland and Wolff shipyard where the ill-fated cruise liner was built. Individual visitors must purchase a ticket for the bridge at the site on the day of and will receive a time slot for crossing. It may be best to arrive early in the morning, as tickets often sell out during peak periods. Wear sturdy walking shoes for the 20-minute walk from the parking lot to the bridge—some of the stone steps along this path can be slippery when wet. The bridge is not suitable for the mobility impaired. 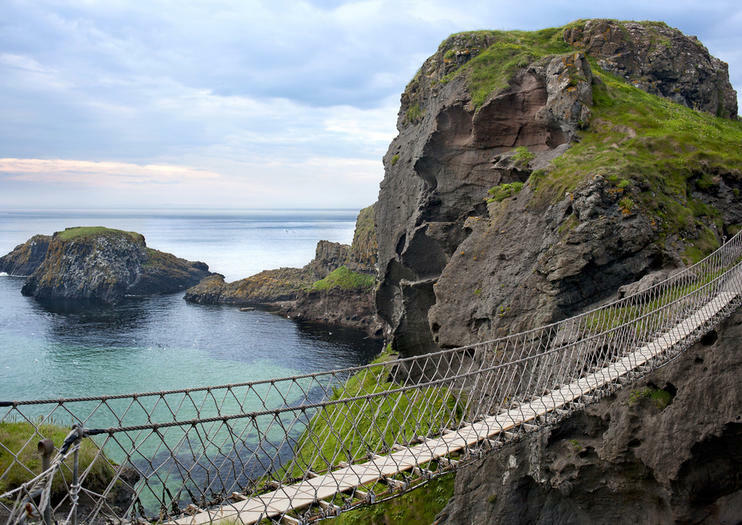 The Carrick-a-Rede Bridge is situated in County Antrim, about 60 miles (96 kilometers) north of Belfast city. The easiest way to travel is by guided tour. Visitors can also take Ulsterbus 252 or Ulsterbus 376 (also known as the Causeway Rambler) during summer. The bridge opens daily from 9:30am. Closing time varies by season but is as late as 7pm in peak summer and as early as 3pm in winter. Ticket sales stop 45 minutes before closing. Book a guided tour or arrive first thing in the morning to secure your shot at crossing the bridge. Only a certain number of people are allowed on the bridge at any time, and timed tickets help keep lines manageable and moving. Avoid windy days when the bridge may be closed for safety reasons. With so much attention placed on the bridge itself, many travelers give little thought to the island to which it connects. Though tiny, the grassy islet is worth exploring. Look for the traditional fisherman’s cottage, open to visitors on select weekends of the year, and keep an eye out for wildlife. Seabirds such as guillemots, razorbills, and kittiwakes patrol the coastline, while basking sharks, dolphins, and porpoises frolic in the surrounding waters. Discover Northern Ireland with the best value combination ticket. Ticket will include: One day city tour hop on hop off pass, Titanic Belfast admission, Giant's Causeway day tour. When booking, you choose the date you wish to do the Giant's Causeway day tour and then you can choose to do the city tour and Titanic Belfast admission on any other day that suits you. Titanic Belfast is located at stop number 5 on the city tour. * Giant's Causeway tour includes admissions to the Giant's Causeway Visitors Centre AND Carrick-a-Rede Rope Bridge. At the Causeway Visitors Centre, there is also a self guided walking tour included in the price. Visit some of Ireland’s most popular attractions during this 6-day tour from Dublin. Choose from three different lodging options, and have your accommodations and transport taken care of for five nights and six days. Pass the Peace Wall in Belfast, visit Giant’s Causeway and the Carrick-a-Rede Rope Bridge, and kiss the Blarney Stone in Cork. Travel around the Ring of Kerry, and see the Cliff of Moher, Dunluce Castle, and the Dark Hedges, made famous by Game of Thrones. Southern Ireland is said to be one of the most beautiful places in the world. See its majestic beauty for yourself during this 2-day tour that takes you to the area’s top highlights with round-trip transport from Dublin included. See Blarney Castle and the famous Blarney Stone, Bunratty Castle, the Rock of Cashel, the Burren, and the Cliffs of Moher. Plus spend time cruising through the stalls at the English Market in Cork, and catch sight of King John's Castle and River Shannon in Limerick. Set out for a two-day exploration of Northern Ireland from Dublin. Visit the Celtic ruins of Monasterboice and enjoy Belfast's incredible Titanic Experience, an interactive walk-through telling the story of the ill-fated ocean liner. Spend free time exploring the streets and sights of the lively capital, including places like the renowned Crown Liquor Saloon and the Grand Opera House. The following day see sights recognizable from the HBO series 'Game of Thrones,' then depart for The Giant's Causeway, thousands of interlocking basalt columns that are Northern Ireland's only UNESCO-listed site. Immerse yourself in the rich culture and visual wonders of Ireland on an enriching 9-day tour from Dublin. Alongside a hospitable guide, explore the magical kingdom of Kerry, home to the staggering 750-foot (228-meter) Cliffs of Moher, and capture the wild spirit of the rural Connemara region. See historical monuments in Derry; gaze at the mystifying rock sculptures at Giant’s Causeway; and gain fascinating insight into the rich culture and history of Ireland from your knowledgeable guide. Spend 8 nights in comfortable accommodation and enjoy a traditional Irish breakfast every day.